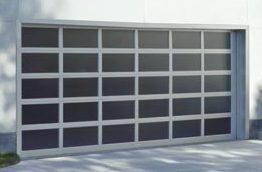 Full view glass garage doors are the perfect blend of architecture and functionality. A variety of options to match any home. 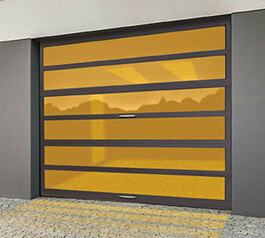 If you are searching for a garage door that is modern, you should consider the contemporary look of a glass door. A glass door will transform the look of your home, using the sun’s rays to change the appearance from brilliant in the daylight to warm and comforting at night. Our service carries a wide array of glass doors that will make your home stand out with unique designs. Our doors are aesthetically pleasing, clean, distinctive, and will unquestionably make your home look beautiful. 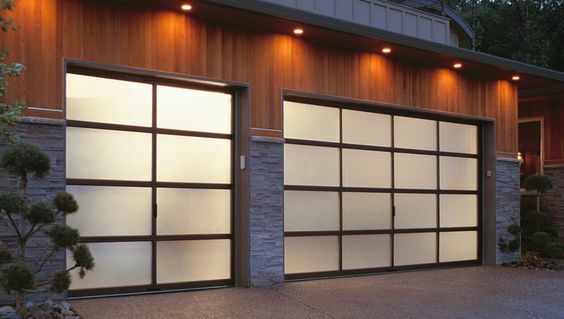 Aside from being attractive, glass garage doors are also becoming trendy because they add value to the house. It can provide a different look to every home. 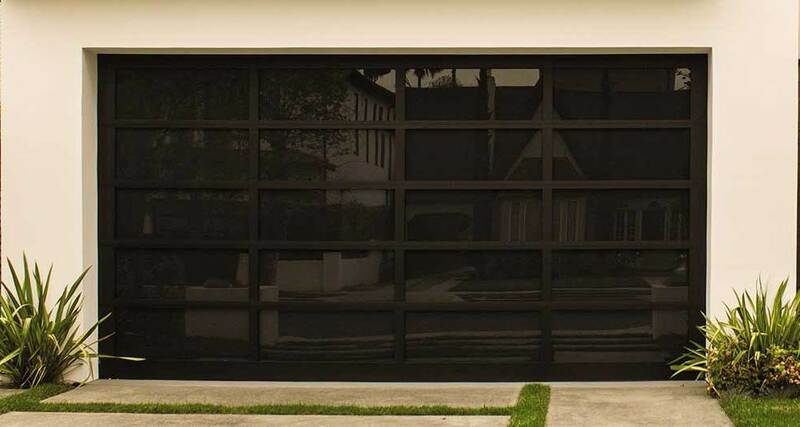 Whether you are going for dramatic, chic, or modern, a glass garage door could be the perfect option for you. Additionally, they are easy to clean, they do not corrode, and they can be inexpensive to maintain with a simple glass cleaner. 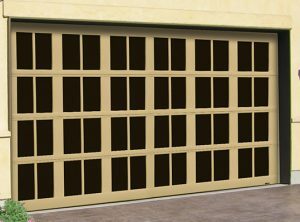 When installing a glass door, you will need to enlist the knowledge of a professional garage door installer to ensure the proper performance and durability of the hardware. Our service has a team of experts with the highest level of competence in the field of all door installations, especially glass doors. Besides being well trained, our technicians are truthful and reliable. We conduct a series of background checks to ensure that our experts are unsurpassed. If you decide to enlist our services, you can rest assured that you will be receiving the best possible workmanship. We will provide you with amazing discounts and all available manufacturers’ warranties as well as our own special deals. 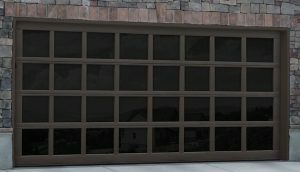 We offer a wide selection of options when it comes to glass garage doors. We can install clear, tinted, mirrored or frosted glass which can be combined with aluminum or steel for added strength. You may also choose between insulated and non-insulated options. Insulated glass doors are a great money saving option because they are energy efficient and will save on bills during severe and unexpected weather conditions. By booking with us to install your glass door, you will be a part of a collection of customers who enjoy our guaranteed professional service. Our fantastic prices and efficient installation are unmatched. Additionally, you will be receiving incredible customer service. Rest assured that you will be able to contact us with any questions during the entire installation process. 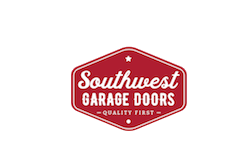 Call Southwest Garage Door today! Frame and solid aluminum panels available in choice of anodized and powder-coated finishes or a faux wood Ultra-Grain. 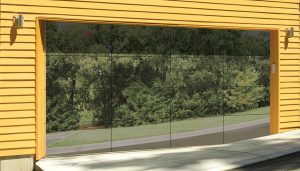 Glass panels are mounted on top of an aluminum structure for an ultra-modern, frameless look on an easy-to-maintain door. Door design combines strong horizontal lines with long, narrow expanses of equal height glass to make a distinctive design statement.